One of the greatest moments in a parent’s life is the moment that their child decides to accept God’s call on their life to follow Jesus. We had one of those moments recently, when my twelve-year old daughter turned to me out of the blue and said, “Dad, I’m ready to be baptized.” After probing her a little about her decision, I was convinced that she understood what she was saying because she said, “I want to let people know that I’m not ashamed to follow Jesus.” Needless to say, my wife and I were thrilled and we contacted our pastors and youth leader and made arrangements for my daughter to be baptized that week. I’ve been involved in adult and middle school ministry for many years and we often tell the kids that to follow Christ is to make him the “boss of their lives.” Adults normally use the phrases “ask Jesus into your heart,” “accept the gift of salvation,” or begin a “relationship with Christ.” I made that choice to follow Jesus over twenty years ago, but lately I have been wondering if asking folks to make Jesus the boss of their lives, accept a gift, or to invite them to have a relationship with Christ is the best that we can do. Have no other Gods before Him. Don’t exchange worship of God with the worship of idols because the Lord our God is a jealous God. Don’t misuse the name of God. As I have been reflecting on these verses it occurred to me that these verses accurately describe a husband who is passionately in love with his wife. I love my wife and I would not be too happy if she put another man before me, exchanged her adoration of me with an adoration of shoes or chocolate, or if she spoke badly about me in my presence or behind my back. God says that He is a jealous God. A husband who truly loves his wife should get a little jealous towards anyone or anything that competes for her affection. I’m really wondering if asking folks to make Jesus to be the boss of their lives, accept a gift, or inviting them to have a relationship with Jesus fully captures God’s call to yada’ Him. I like my boss but I would not use the word yada’ to describe my relationship with him. I like gifts, but the thrill of giving or receiving a gift is fleeting. I have lots of friends that I care deeply about, but I’m not sure if I’d say that they are yada’ –like relationships. Wouldn’t it be better to view a baptism as a wedding? In a wedding, the bride and groom go to great lengths to prepare themselves for the big day. 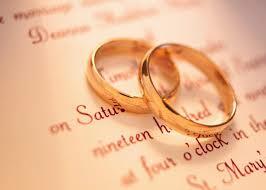 They exchange public vows of commitment for each other before God and the people that they love. What if we took our commitment to follow Christ as seriously as we took our vows to the man or woman that we decide to spend our lives together with? Jesus said that if we want to follow Him we would be wise to count the cost (Luke 14:28). Although a great start, I’m not sure that raising our hands out of a moment of emotion or peer pressure is really counting the cost of following Christ. Wedding vows and baptisms are meant to be a lifetime commitments. The problem is that our desires often get in the way of our commitment. Marriages fail. Baptisms are forgotten. Being a perfect spouse or follower of Christ is impossible without the guidance and strength provided by the Holy Spirit. Jesus said that it was better that He went away so that the Comforter could come and be with us (John 16:7). Isn’t the description of the Hebrew word yada’, “mingling of the souls,” a really good way to understand our relationship with God through the indwelling presence of the Holy Spirit? God loves us so much that He created us, died for us when we didn’t deserve it, and then in a process of getting even closer to us, He desires to indwell us through the Holy Spirit. That’s yada’! So I’ll leave you with this thought. What if we approached our decision to follow Christ and our baptism like we approached our wedding? What if we took our vows to Christ as seriously as we took our vows to our groom or bride? What if we celebrated our new commitment with rings, food, wine and dancing? What if we truly understood that the God of the Universe wanted us to love Him as passionately and intimately as He loves us? What if at a baptism we used the same vows that we use at weddings? I, Len Winneroski, take you, Jesus, to be my lawfully wedded Lord and husband, my constant friend, my faithful partner and my love from this day forward. In the presence of God, our family and friends, I offer you my solemn vow to be your faithful partner in sickness and in health, in good times and in bad, and in joy as well as in sorrow. I promise to love you unconditionally, to support you in your goals, to honor and respect you, to laugh with you and cry with you, and to cherish you for as long as we both shall live. As always, both a good read with thought provoking thoughts!!! Thanks JD. I’m working on the next installment called The Sacrifice.